Each unit component is housed within a modular section having as standard, a casing construction consisting of an ‘Aluzinc’ steel chassis framework enclosed with 25mm thick insulated ‘Plastisol’ finish double skin panels and access doors. Chassis frames are fabricated from rigid press formed 1.5mm gauge ‘Aluzinc’ steel single skin pentapost angles mechanically secured to pre-painted die cast aluminium corner components and air sealed internally. The ‘Aluzinc’ steel used in manufacture of our standard units has been chosen for it’s significant corrosion resistant properties having been developed in Sweden for use in the offshore oil industry and is proven to considerably out perform standard galvanised steel. Aluzinc has a life expectancy of at least 20 years in most normal environments and can be easily painted requiring simple pre-treatment, unlike normal zinc galvanised steel. Units requiring 50mm thick panels would be manufactured using an anodised aluminium chassis frame mechanically secured to pre-painted die cast aluminium corner components and air sealed internally. Panels are formed from nominal 1.0mm gauge ‘Plastisol’ finish (plastic coated Aluzinc) mild steel outer skins with folded edges and sealed corners, are insulated internally as standard, with 25mm thick rigid mineral fibre and faced with a natural finish Aluzinc steel folded inner skin. Double skin panels are assembled using mechanical fixings to ensure a rigid construction and externally finished in Merlin grey. 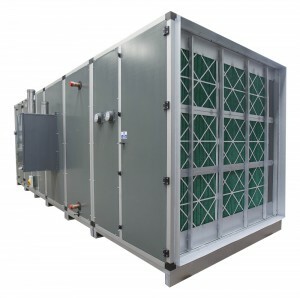 Normal fixed panels are secured to the chassis frame by means of hexagon head self drilling screws and sit flush onto a PVC rubber gasket air seal located within the frame recess. Double skin panels of 50mm thickness would be insulated with 50mm thick rigid mineral fibre and manufactured with the same material finish as for 25mm panels. Panels or doors for general maintenance are precision fitted to the unit framework using purposed designed robust plastic hinges and provided with a key operated quick release fastener, clamp fasteners and lifting handles. Indoor units have panels finished as standard in Merlin grey Plastisol steel and either natural Aluzinc finish or anodised aluminium chassis frames. Support bases on small to medium size units are manufactured and finished in natural Aluzinc. External units have panels finished as standard in Merlin grey Plastisol steel and natural Aluzinc finish or anodised aluminium chassis frames. Support bases on small to medium size units are manufactured and finished in natural Aluzinc and chlorinated rubber based painted finish RSC bases on larger units. External mounted units are provided as standard with a pitched roof manufactured from Plastisol finish Aluzinc steel. 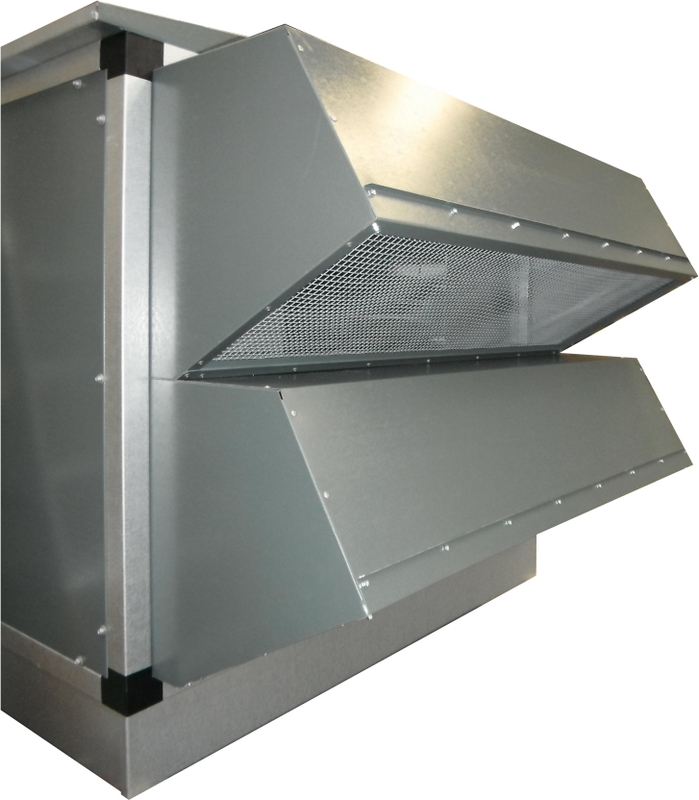 Small to medium size units have as standard, support bases manufactured from press formed 14 gauge Aluzinc steel channels and heavy gauge Rolled Steel channel support bases on large units. External units or large section internal mounted units are also provided with lifting points to facilitate off-loading by crane and hoisting into the desired plant location.